The third annual American Society of Golf Course Architects Design Excellence Recognition Program has recognized Nicklaus Design and Trump National Golf Links at Ferry Point in the Bronx, New York, with one of 12 “Design Excellence” awards for 2014. Since its creation in 2012, the Design Excellence Recognition Program has shined a light on the innovation and problem-solving skills required of today’s golf course designs. 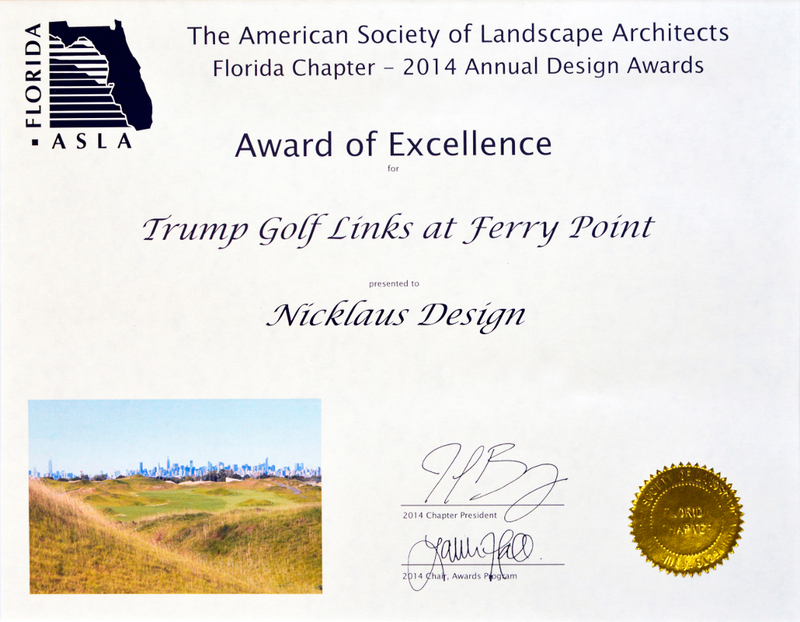 Nicklaus Design and Ferry Point also received recognition by the Florida Chapter of the American Society of Landscape Architects. The New York City course was one of 30 recipients of the organization’s 2014 Design Awards, and was recognized with the Environmental Sustainability Honor, as well as in the Resort and Entertainment Category with an Award of Excellence. In awarding Ferry Point the Design Excellence Recognition, the American Society of Golf Course Architects (ASGCA)—the oldest professional organization of golf course designers in America—lauded the environmental responsibility of the Ferry Point project. “How does land get transformed after 20-plus years as landfill to an Irish Links-style course? For this Jack Nicklaus Signature course in collaboration with [John] Sanford, it was by working with the land and striving to improve the environment, along with creating really good golf,” the ASGCA said. To date, at least 23 past and present designers who have supported the work of Nicklaus Design have gone on to earn membership in the prestigious American Society of Golf Course Architects, including Ferry Point course designer Jack Nicklaus, Design Associate Jim Lipe, and John Sanford, who collaborated on the project. The 2014 nominations were reviewed by a panel of golf industry leaders, including representatives of the Club Managers Association of America, Golf Course Superintendents Association of America, Golf Course Builders Association of America and National Golf Course Owners Association. The Environmental Sustainability Honor by the Florida Chapter of the American Society of Landscape Architects is presented by the Awards Jury to a single project that exhibits sound sustainable practices as described by the ASLA Environmental Sustainability Policy Statement. The American Society of Landscape Architects believes that both human civilizations and the natural ecosystems represent integral parts of our environment, and therefore must be protected, restored, and perpetuated. In order to provide a healthy, productive, and socially enriching life for all, the Society urges public and private decision-makers to employ sustainable design policies and practices, minimize environmental degradation, avoid excessive consumption, and respect the needs of future generations. Trump National Golf Links at Ferry Point features native fescue grasses that cover more than 50 percent of the course, which has only 70 acres of irrigated turf. More than one-third of runoff is recirculated back to the irrigation pond and reused on the course. The balance is delivered to basins, which trap and filter sediments, nutrients and chemicals. The course is scheduled to host a 2017 PGA Tour event, and will open to the public in 2015 upon completion of its clubhouse.